An electrode is defined as a point where current enters and leaves an electrolyte. When current leaves an electrode, it is known as a cathode, and when it enters it is known as an anode. Electrodes transport electrons to one half cell to another producing an electrical charge. The charge is measured with the standard electrode system (SHE) with a reference potential of 0 volts which serves as a medium for any cell potential calculation. Electrons are vital components of electrochemical cells. An electrode is a metal and its surface serves as the location where the oxidation-reduction equilibrium is established between the metal and the solution, whatever it may be. If the electrode is an anode, it receives current or electrons from the electrolyte mixture and oxidizes. When atoms or molecules get close to the surface of the electrode, the solution that the electrode is in donates electrons, causing the atoms to become positive ions. What Is an Electrode Made Of? Electrodes are usually metals but the type depends on whether it’s involved in the reaction. Some reactions require an inert electrode that does not participate. Other reactions require solid forms of the reactants, making them electrodes. Commonly used inert electrodes can be made of graphite, platinum, gold or rhodium. Reactive electrodes can be made of copper, zinc, lead or silver. A Standard Hydrogen Electrode is used by scientists for reference on all half cell potential reactions. The standard electrode potential is zero, which forms the basis necessary for calculating cell potentials using various electrodes of concentrations. A Standard Hydrogen Electrode is made of a 1.0 M H+ solution which contains a square piece of platinized platinum inside a tube. Electrodes act as a holding place for electrons. You can connect the electrons with a terminal, but nothing will happen until you put a salt bridge between the two containers. This is usually a U shaped hollow tube filled with salt. It will provide a way for the ions to move from one container to the other, keeping the solutions neutral. Once the electrons start flowing, zinc oxidizes and releases electrons that flow through the wire to the copper electrode where they can be used to form copper metals. Copper ions from the copper sulfate solution are plated out on the copper electrode while the zinc electrode is consumed. The cations in the salt bridge move over the container with the copper electrodes replacing the copper ions while they are consumed, while anions in the salt bridge migrate toward the zinc side where they keep the solution containing the newly formed zinc cations electrically neutral. In this case, the zinc electrode is working as the anode, where oxidation is taking place, and is labeled with a “-“ sign while the copper electrode is working as the cathode, where reduction takes place, and can be labeled with a “+” sign. The three electrode system is an important part of voltammetry, an electrochemical technique which measures the current that develops in an electrochemical cell under conditions where voltage is in excess of what is predicted. The three electrodes in this system are the working electrode, the reference electrode and the auxiliary electrode. The reference electrode has an established electrode potential. In an electrochemical cell, the reference electrode can be used as a half cell. This enables the other half cell’s electrode potential to be discovered. The auxiliary electrode functions to ensure that the current does not pass through the reference cell. It makes sure the current is equal to that of the working electrode’s current. The working electrode transports electrons to and from the substances that are present. Calomel Electrode: This consists of mercury and mercury-chloride molecules and can be easier to make and maintain than the SHE. It is necessary that the solution is saturated allowing activity to be fixed by the potassium chloride so the voltage will be lower and closer to the SHE. The saturation will also allow for the exchange of chlorine ions to take place inside the salt bridge. Silver-Silver Chloride Electrode: this electrode precipitates a salt in the solution that is used in the electrode reaction. It consists of a solid silver and its precipitated salt. This is a widely used reference electrode because it is inexpensive and not as toxic as the calomel electrode that contains mercury. It is made by taking a solid silver were and coding it in AgCl then placing it in a solution of KCl and AgCl. Ions will be formed as electrons form in and out of the electrode system. Electrodes are an important part of how electricity works. 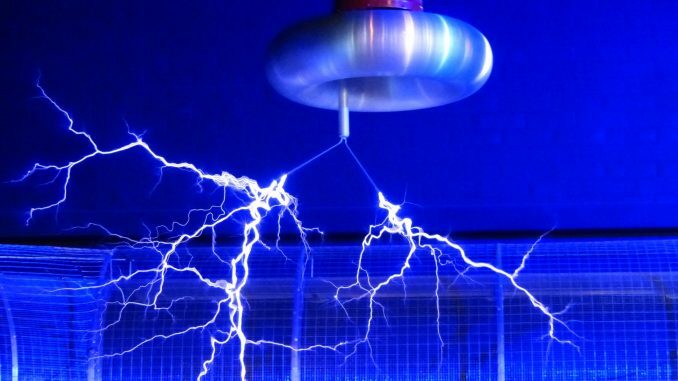 It is fascinating to learn more about the science behind them and how they function in the electrical process. Those that are interested should feel encouraged to find out more about the electrical process and how electrodes are involved in the simple functions we see everyday.